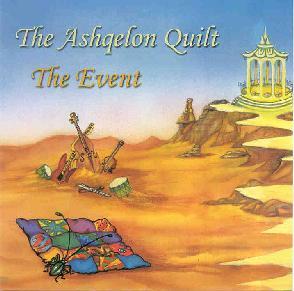 The Ashqelon Quilt - "The Event"
Likening themselves to a quilt is an apt description. Hailing from Israel, this three-piece band produces a music that is a bright and colourful patchwork of styles including progressive rock, psychedelic pop, Irish folk, medieval music, jazz, classical, and space rock. This may sound like an impossible combination of styles, and to be sure, the album takes a few listens before you start to tweak to its numerous charms, but when you do, there's no turning back. You will fall in love The Ashqelon Quilt. Multi-instrumentalist brothers Ori and Sachar Hendel trade back and forth on songwriting duties. Sachel has classical music training from university, whereas Ori is self-taught, and these complimentary backgrounds are part of what gives the music its interesting dynamics, with both a studied classicism and a raw improvised feel. Sharon Rinat joins them on baroque recorder. All three, at one point or another, take lead and backing vocals. One of the catchiest songs is the first one on the disc, One by One, opening with a little bit of mandolin and recorder before breaking into some truly delicious psychedelic pop. There's a great instrumental break halfway through featuring a duel solo between violin and jazzy electric guitar that morphs into a blazing rock solo with a Middle Eastern feel, before returning to the verse and chorus of the song. And all of this in just 3 ½ minutes! Crown stretches out more, to 6 ½ minutes, blending strummed acoustic guitars, impressionistic piano with classical overtones, and dreamy and sometimes dissonant violins, with Sachar and Sharon creating beautiful vocal harmonies. The Coin is even longer, at almost 9-minutes featuring Ori's high, pure vocals and lots of great guitar work that is both bluesy and psychedelic. There's a lengthy space jam in the middle of this one, with processed guitar, strange sound effects, and ethnic percussion. Twilights is a soft number with 12-string guitar, tinkling piano, and some gorgeous, trippy strings in the chorus. Introduction to the Event actually doesn't seem to have much musical connection to The Event, the song that follows it. It's a brief piano piece with a classical feel, and lilting, choral like voices singing in Hebrew (the rest of the vocals on the album are all in English). The Event, on the other hand, starts with pounding, primal polyrhythms and symphonic keyboards before kicking into high gear with a great, medieval sounding dance bit featuring Sharon Rinet's fine recorder work. The middle of the song is more piano based, with some intriguing and challenging melodies. Tel Aviv Stress is more of a conventional pop tune, with a vocal duet between Ori and Sharon. The lyrics show the band has sense of humour despite the stresses of modern city life they are singing about ("Every night my neighbour sniffs coke until he drops/I wonder-should I join him, or should I call the cops?") Substitute is a mellow refection with soft electric and acoustic guitars, jazzy stylings, and psychedelic lyrics. The Well closes the album in epic fashion. At 11 ½-minutes, it's the most progressive track on the album, but also features an almost maddeningly catchy melody for the vocal parts. It builds from a bouncy, keyboard based pop tune with groovy organ, into a complex and dramatic piece with layers of organ, piano, and wailing synthesizers. The Well has not only some of the heaviest moments on the album, but also some of the softest and most dreamy moments. While Ori and Sachel both have distinctive and pleasant voices, my only criticism of the album would be that Sharon's wonderfully angelic and versatile voice was underused. I would have liked to hear a lot more of it. But it's a minor point, which can't even really be called a flaw. The Ashqelon Quilt has the ability to pack a lot of ideas into each song, but still make it work. It makes for music that is both easy to listen to and challenging to listen to at the same time. Highly recommended! Visit The Asheqelon Quilt at their web site: http://www.ashqelonquilt.com. Headline is part of the Hi-Note Music group. Their web site is at: http://www.hinotemusic.com. Contact via snail mail c/o Hi-Note Music; PO Box 26; Windsor; SL4 2YX; Canada.